Various Fujian kilns, particularly those around Zhangzhou, produced cheaper versions of vessels made by the famous Dehua kilns, further north in Fujian province, which produced fine white porcelains. For Dehua versions of the present design see a piece in the British Museum, London, illustrated in Soame Jenyns, Later Chinese Porcelain, London, 1951, pl.CXX, fig.1. 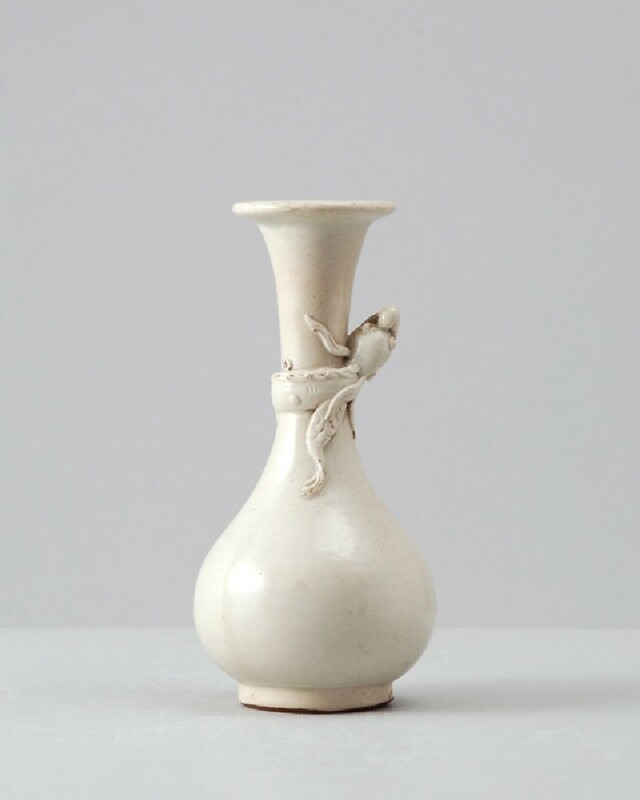 The slender pear-shaped vase is supported on a straight foot with low broad footring and the neck, which flares towards the rim, is surrounded by a freely modelled dragon. The animal is coiled around the vase, its head pointing up, represented with applied eyes and snout, and trailing strands of hair, the short slender body with applied hooks down the spine, terminating in a long thin tail, the legs with stamped ring markings to indicate scales. The buff-coloured body bears an opaque cream-coloured glaze.